Toronto, Ontario--(Newsfile Corp. - April 9, 2019) - Aurania Resources Ltd. (TSXV: ARU) (OTCQB: AUIAF) (FSE: 20Q) ("Aurania" or the "Company") reports that high-grade copper and silver have been found over an area measuring 6 kilometres ("km") by 3km in the Kirus target area in the Lost Cities - Cutucu Project ("Project") in southeastern Ecuador. Samples from boulders in streams contain up to 12% copper with 166 grams per tonne ("g/t") silver. Follow-up exploration of these streams has led to the discovery of outcrop with grades of up to 5% copper with 70g/t silver. Aurania's President, Dr. Richard Spencer, commented, "Kirus is remarkably like the Tsenken target reported on last week (see press release dated April 2, 2019). The targets, 6km apart, are associated with highly magnetic features evident in the geophysics survey that we flew over the Cutucu - Lost Cities Project. Both targets have high-grade copper and silver in sedimentary rocks over, and adjacent to, their respective magnetic feature. The significance of these sediment-hosted targets is that they are sheet-like and would be relatively simple to drill. The magnetic features are interpreted to be porphyry bodies that represent deeper targets that would be drill-tested later in our exploration program." "The sixth bore hole is underway at Crunchy Hill. No assays have yet been received from the Lab. We intend to release results once we have assays from a cluster of drill holes that allow us to understand the context of any mineralization intersected." 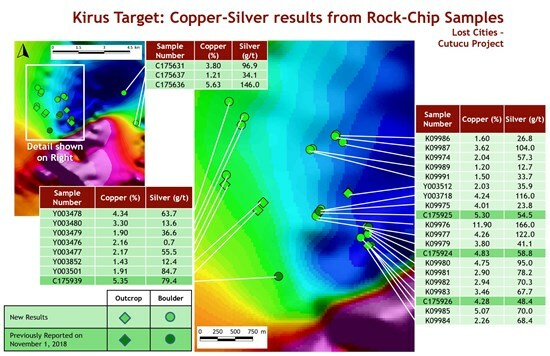 Reconnaissance exploration identified boulders in streams that contain up to 11.9% copper with 166g/t silver. Follow-up exploration has led to the discovery of mineralization of up to 5.1% copper and 70g/t silver in sporadic outcrops in dense jungle over a 2km trend immediately northwest of the Kirus magnetic feature evident in the Company's geophysics data (Figure 1). The copper and silver mineralization is in sandstone and shale, and is especially concentrated where these rocks contain layers of carbon in the form of fossilized plant fragments. The copper minerals observed include malachite, chrysocolla, tenorite and chalcocite. The magnetic feature at Kirus is about 4km in diameter (Figure 1) and is of a similar size to the one at Tsenken. Our current thinking, outlined in the Company's press releases on January 10, 2019 and April 2, 2019, is that these magnetic features relate to clusters of porphyry bodies. Some of the samples were prepared for analysis at ALS Global's ("ALS") lab in Quito, Ecuador and others at MS Analytical in Cuenca, Ecuador. The rock samples were jaw-crushed to 10 mesh (crushed material passes through a mesh with apertures of 2 millimetres ("mm")), from which a one-kilogram sub-sample was taken. The sub-sample was crushed to a grain size of 0.075mm and a 200 gram ("g") split was set aside for analysis. ALS's preparation lab in Quito sent the prepared samples to its analytical facility in Lima, Peru, while those prepared by MS Analytical were sent to its assay facility in Vancouver, for analysis. Approximately 0.25g of rock pulp underwent four-acid digestion and analysis for 48 elements by ICP-MS. A repeat analysis was done on all samples with a grade of greater than 1% copper and/or 100g/t silver. The repeat analysis was done on a 0.4g sample of pulp that underwent digestion in four acids and the resulting liquid was diluted and analyzed by ICP-MS.
ALS and MS Analytical reported that the analyses had passed their internal QAQC tests. In addition, Aurania's analysis of control samples showed that they passed its internal QAQC standards.